his page is designed to allow visitors to the website to submit questions regarding Greentown Glass to the National Greentown Glass Association. These questions will be monitored by the webmaster and every effort will be made to find an answer. While some questions and answers will be displayed on the website, not all will be placed there. However, all questions will receive a prompt reply from the organizataion. Is there a mark on the bottom to identify the Green town glass? Unfortunately, there were no markings on Greentown Glass. Marking glass became popular later, probably once people began purchasing the glass for it's collect-ability. 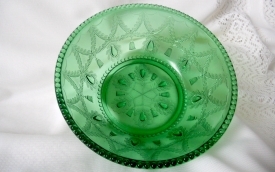 During the time of the Indiana Goblet & Tumbler Co. (the company that produced what is now called Greentown Glass), the company was primarily focused on selling glass. Most of the time, the glass was sold to another re-seller who would sell the glass through their catalogs, stores, or would use the glass as an item that was received free with the purchase of the item the store was really selling. For example, the now popular dolphins were used to hold the jar of mustard or peanut butter the general store was selling. At the time, Greentown Glass was the cheap stuff and the most important thing was to press it quickly so it could be sold, which is why we often times see quality control issues! The Teardrop and Tassel pattern has not been reproduced to anyones knowledge, and they are often found in the cobalt blue. Cobalt Blue and Clear tend to be the more common colors found, however, they are rarely found in Chocolate, Nile Green, Emerald Green, and Opaque White. Amber Teardrop and Tassel can be found, however, I do not think there is a small sauce dish known in Amber. Usually a set would have included one large Master Berry Bowl, and 6 of the smaller sauce bowls, but I cannot say for sure if they were only sold as sets. A factory would have marketed them and sold them in any way the could to make a sale. If they could make a sale as a set, it was a set, if they could sell them calling them cat bowls, they probably would have done so. I recently found this beautiful creamer pitcher that appears to be Greentown Herringbone Buttress but I am wondering if it is a reproduction....it has a fern etched on it. According to current knowledge, Herringbone Buttress has never been reproduced. It is not extremely unusual to find pieces of Greentown Glass with etching on it, however, I have never seen a piece of Herringbone Buttress with etching on it. We would love to see a picture of the item. I picked up a Dewey handled mug today which is in excellent condition. This makes me wonder if these have been reproduced? It is 3 1/2" tall, in vaseline. It is always great to find a piece that is over 100 years old that is in excellent condition. To answer your question, NO, there is no indication that the small Dewey handled mugs were ever reproduced. Although we think it would be unlikely, that is not to say that a company may not try to reproduce a pattern or piece in the future. As a side note, this piece is exceptionally hard to find in chocolate! Congratulations on your piece! It is not known who pressed the Chrysanthemum pattern in chocolate glass. It may be Royal glass, but to my knowledge, there is no evidence of that. It is still collected by Greentown collectors as a Greentown related item. The 2010 NGGA price history describes the piece as rare and values it at $3,000. Could you give me the current value on the small Holly Golden Agate toothpick holder? The 2010 NGGA Price History lists the small Holly Golden Agate Toothpick at $325. Unfortunately we have seen prices come down since 2010 and if you went to sell it, I would have not way of knowing if it would bring that much. It is a beautiful piece though! Please upload .jpg files only.